Java Guru Does Double Duty as "Poster Boy"
Lest you think that being an ambassador is all about attending cocktail parties and getting carte blanche immunity from parking tickets, consider this: During the course of 18 hours, R. Nicholas Burns, the United States permanent representative to NATO, accompanied NATO Secretary General Lord Robertson for breakfast with Secretary of Defense Donald Rumsfeld, meetings with senior senators on Capitol Hill, and lunch with President Bush. 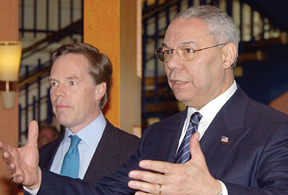 Then came a speech at Georgetown University and dinner with Secretary of State Colin Powell. NATO had taken over responsibility for international peacekeeping in Afghanistan and is poised to assume a peacekeeping role in Iraq, so discussions centered on the future of NATO, the need to modernize military forces, and what role NATO might play in the rebuilding and security of Iraq — a feat that would require some delicate negotiations considering France's and Germany's staunch opposition to the war. After dinner, Burns managed to squeeze in a media interview via cell phone during a brief wait to catch a plane back to Brussels. Most days aren't so high-octane. "Being a diplomat is not the glamorous life you might think," he says. "As the world's leading power we have tremendous responsibilities, and given the terrorist threat, we have to be concerned with security for our military officers and diplomats." Burns, who also must be concerned for his own safety, travels with three bodyguards and, he says, "it's normal for me to work 14- to 16-hour days." Despite the demands, "I enjoy coming to work every day," he says, "and it's a great honor to represent our country." Photo courtesy AP/Wide World Photos Burns, who speaks French, Arabic, and Greek, represents U.S. interests on such issues as counter-terrorism, missile defense, relations with Russia and partners, NATO enlargement and military capabilities, and NATO's relations with the European Union. Previously, he served as National Security Council special assistant to the President for Russian, Ukrainian, and Eurasian Affairs during the George H. Bush and Clinton administrations; was State Department spokesman from 1995 to 1997; and was the U.S. ambassador to Greece from 1997 to 2001. Being an ambassador involves "everything from high politics to dealing with the every day," says Burns. As ambassador to Greece, he says he had "great fun" working with Maryland Senator Paul Sarbanes and Baltimore Orioles owner Peter Angelos to bring the sport of baseball to Greece in anticipation of the upcoming Olympic games, for which, ironically, the U.S. team did not qualify. Burns' current job is uniquely challenging because he serves as the U.S. ambassador to an organization of multiple countries united by a commitment to provide for each other's security. NATO was originally formed during the Truman administration to address the Soviet threat to Western Europe, in alliance with the United States and Canada. Burns was an adviser to Bush and Clinton at the White House during the disintegration of the Soviet Union and worked to help get Soviet troops to withdraw from Estonia and Latvia (for which he was decorated by the Estonian government). There are currently 19 NATO member nations, but by May 2004, seven former Eastern bloc countries, including Estonia and Latvia, are expected to join formally. Photo courtesy AP/Wide World Photos Since 1995, NATO has maintained peacekeeping operations in Bosnia, Kosovo, and now Afghanistan in cooperation with the United Nations. Burns is not concerned that NATO will be eclipsed by the U.N. "Their roles are complementary, but very different," he says. 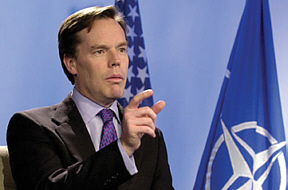 "With several million troops in uniform, NATO is the greatest military alliance in recorded history. Peacekeeping, and indeed sometimes diplomacy, would not work without the threat of force, and the world knows NATO will use force when necessary against tyrants." Burns describes the very public rift between the United States and historic NATO member nations Germany and France over the war in Iraq as one of the most challenging moments of his career. "Sixteen NATO member nations supported us, but France, Germany, and Belgium did not," says Burns, who was frustrated by the inability to craft any kind of agreement or compromise. "It was very divisive, and we're still working to repair the damage, but I think we're making progress." Prince Bandar Bin Sultan Bin Abdul Aziz, SAIS '82, Ambassador of the Kingdom of Saudi Arabia to the U.S.
Sir David Manning, Bol '72, British Ambassador to the U.S.
George Saliba, Bol '69, SAIS '70, Maltese Ambassador to the U.S.
Guangya Wang, SAIS '82, Chinese Ambassador to the U.N.
Zeid Raad, A&S '87, Jordanian Ambassador to the U.N. Drinking Coffee Elsewhere, by ZZ Packer, A&S '95 (MA), Riverhead Books (2003). This first book by Writing Seminars grad Packer includes stories originally published in The New Yorker. With settings that range from Brownie Camp to the Million Man March, these stories tackle questions of race — and of life — with intelligence, warmth, and humor. House Under Snow, by Jill Bialosky, A&S '80 (MA), Harcourt (2002). It is a bit flippant to dub this the mother of all Jewish mother stories, but the thought does come to mind as the anguish of one generation plays upon the mind of the next. The novel's voice is that of a daughter whose primary inheritance is a forgiving nature, which is constantly put to the test. Cake, by Tristan Davies, A&S '87 (MA), Johns Hopkins University Press (2003). Tristan Davies' debut collection of short stories about the complexities of love and relationships is vivid and deftly written. Using just a few pages, he brings his characters to life. Phoebe Stanton always made an impression. The Baltimore Sun architecture critic and Johns Hopkins professor, who died in September at the age of 88, inspired reverence and, sometimes, trepidation. When architects brought their ideas before Baltimore's Design Advisory Panel or the Architectural Review Board, they could only hope that Stanton, a longtime advocate for the city's urban aesthetic, would see beauty in their creation. "Stanton could always be counted on to say what she thought about a project," Edward Gunts, the Sun's current architecture critic, wrote shortly after her death. "She could be crotchety, irascible, tart-tongued with presenters, calling a building 'dreadful' or 'horrid' if it were deserved." Phoebe Stanton Students at Johns Hopkins, where she taught for 27 years, appreciated that honesty, boldness, and righteous sense of style. When one of her art history students once inquired about her fabulous wardrobe, she quickly replied, "You can't teach people about the beauty of art and then look like a bag lady." Her Introduction to Art History course was an unforgettable rite of passage for a generation of Johns Hopkins students. "Phoebe Stanton was the reason why almost every student took Art History," says India Lowres, A&S '76, "regardless of their major." When Johns Hopkins went co-ed in 1970, Stanton became an immediate role model for those first female pioneers. "Her excitement was contagious," says Laura Nettleton, A&S '77, an architect from Pittsburgh. "Powerful, tough, feminine — that was Phoebe." But Stanton's influence stretched far beyond the burgeoning feminism of the era, and she was repeatedly recognized as one of the best and most popular professors on campus. "I was one of the lucky ones who learned what I know about art from this master," John Miller, A&S '66, SPSBE '74, wrote in a letter to the editor of the Sun in October. "Ms. Stanton opened my eyes to sculpture and painting like no other person could have. She really was a treasure in her own right." A treasure who influenced Baltimore's map and skyline for more than 30 years, Stanton used her knowledge of design and history to guide a series of urban redevelopment and conservation efforts, stretching from the Inner Harbor to Mount Vernon. "Baltimore has lost its design conscience, a tireless public servant who considered it her mission in life to improve the quality of local buildings and public spaces." Edward Gunts, Baltimore Sun architecture critic "She was a wonderfully free spirit with an astonishingly large heart," says Walter Ramberg, a professor of architecture at Catholic University who worked with Stanton on the Design Advisory Panel. "She was unlikely not to be noticed." "She used to say, 'This world is not for the timid,'" says Michael Stanton, her only son and chairman of the Department of Architecture at the American University of Beirut. Horrified by social injustices, she spoke out against the war in Vietnam and sympathized with the Palestinians. "My mother was a warrior, in her own way," he explains. "She defended lost causes and took unpopular stands, and because of her, some of those causes were saved." The daughter of Lebanese immigrants, Stanton, n�e Baroody, was born in Savannah, Illinois, and spent her childhood in Chicago and Lebanon. She graduated from Mount Holyoke in 1937, received her master's from Radcliffe in 1939, and earned her doctorate from the University of London in 1950. In 1954, she moved to Baltimore with her husband, Daniel, a planner and urban renewal administrator (who died in 1966), and began lecturing at Johns Hopkins soon after. In 1971, she was named chair of the History of Art Department. In addition to her architectural board memberships and her regular contributions to the Sun, Stanton also authored several articles and two books, The Gothic Revival and American Church Architecture: An Episode in Taste 1840-1856 and Pugin. After retiring from Johns Hopkins in 1982, Stanton maintained an office at Peabody Conservatory, where she received colleagues, advised students, and continued to work with her committees and the city of Baltimore. In August, two months after poor health forced her to give up her seat on the Design Advisory Panel, the city honored her for 33 years of distinguished service. A prolific traveler, Stanton purchased a one-way ticket for one last trip to Beirut on October 1, to visit relatives and to be closer to her son. But, due to complications from heart disease and emphysema, it wasn't to be. Wrote Gunts: "Baltimore has lost its design conscience, a tireless public servant who considered it her mission in life to improve the quality of local buildings and public spaces." In Baltimore, where her fingerprint can be observed on virtually every neighborhood, Phoebe Stanton will never be replaced. 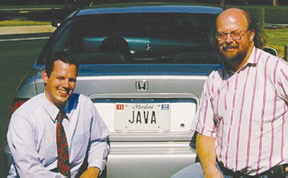 When non-techie types see Marty Hall's "JAVA" license plate, they may assume he has a certain fondness for caffeinated beverages. But the computer literati know better: The license plate refers to a versatile computer programming language — one that's so popular, even those who don't know it have probably used it on the Web. "The technology is solid," says Hall, a Hopkins grad who earned an engineering degree in 1984 and a master's degree in computer science in 1986. "So it's used for things like airline reservations or online banking, where good performance and security are important." Hall should know. He is the author of best-selling Java programming books, including Core Web Programming and the international best seller Core Servlets and JavaServer Pages, from Sun Microsystems Press and Prentice Hall. Core Servlets and JSP spent five months as the top-selling Java book at Amazon.com and more than two months as the top-selling computer book of any kind at fatbrain.com. The books were translated into 11 foreign languages, and Core Web Programming has been widely used in academia at institutions such as Stanford, MIT, Princeton, UCLA, and Johns Hopkins. Hall (left) with JAVA inventor James Gosling The success of Hall's books and short courses prompted him to go on leave from his job as a senior computer scientist for the Johns Hopkins Applied Physics Lab to start his own training and consulting business, coreservlets.com. He continues to write books, do Java consulting, and train software developers for clients such as General Motors, Lexmark International, Banco Popular, General Dynamics, and the Los Alamos National Laboratory. He also teaches classes in subjects relating to Java and Web technology in Hopkins' part-time computer science program, where he developed a concentration in Web technology and distributed computing. Hall's courses and seminars have received rave reviews from students worldwide, with recent courses held in Tokyo, Puerto Rico, and for developers at the New York Stock Exchange. "I think I enjoy teaching because, usually, the people I work with have real-world problems to solve and projects to do, so they're motivated," says Hall. "Theory is fun, but not as much fun as putting it into practice." As a self-professed "computer geek," Hall was among those in the early '80s who were using a prototype of "the Web" before it became available to the public. Originally, the network allowed defense industry workers to communicate with each other about projects. It quickly grew into a way to communicate about anything, became available to the public, and skyrocketed. Even though he was in on the ground floor of the Internet revolution, Hall is still amazed by what does and doesn't succeed. "I'm probably more cynical now than I used to be, because out of 100 good ideas, maybe three will take off and 97 will flop," he says. "It's hard to predict. For example, HTML [the language for World Wide Web pages] is actually pretty lousy. If we could start the Web over from scratch we could do better. But that might help explain why Java servlets and JSP are so popular: It's a way to make a clunky language [HTML] and an unwieldy protocol [HTTP] more convenient." With his affable nature and all-American looks, Hall certainly doesn't fit the stereotype of a computer nerd. In fact, he has become the "poster boy" for Hopkins' part-time engineering program, with his image appearing in a variety of advertisements. "People will say, 'Hey, I saw you on a poster in a movie theater,'" says Hall. "Friends send copies of ads to my wife, and that's how I'll find out that I appeared in a place like U.S. News & World Report. It's fun, but sometimes it's embarrassing to look up and see your face staring back at you from a bus." 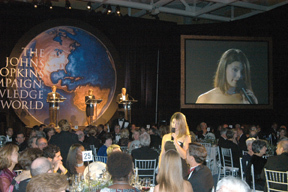 Visitors to the October 25 gala for the Knowledge for the World campaign were greeted by harp music, a transformed Ralph S. O'Connor Recreation Center, and later that evening, good news: Board of Trustees chair Raymond A. "Chip" Mason announced that, so far, donors had committed more than $1.16 billion, 58 percent of the $2 billion goal. Scholarship recipient Andrea Gottlich, A&S '05, thanks donors for their support. Mason also announced that an anonymous family had just committed $20 million toward construction of the Neo-natal Intensive Care Unit (NICU) in the planned children's and maternal hospital, and to endow a fund that supports the pediatric faculty members who work in the NICU. "Their gift provides tremendous momentum for the ambitious building initiative under way at the hospital and School of Medicine," said Mason. That initiative includes the new children's and maternal hospital, new research buildings, and a cardiovascular and critical care tower. 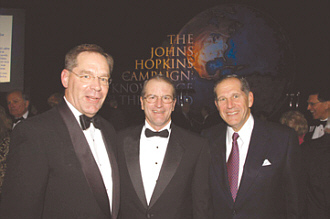 Right, President Brody (center) with (to his left) University Trustee William Ward Jr. and Morris Offit, co-chair of the Knowledge for the World campaign Several videos throughout the evening highlighted the work of innovative, younger faculty, as well as plans for new and improved facilities. Capital priorities on other campuses include completion of renovations at the Peabody Institute and, at Homewood, the construction of a new computer science facility. Campaign priorities also include increased endowment for scholarships, fellowships, endowed professorships, and support for research and academic programs. 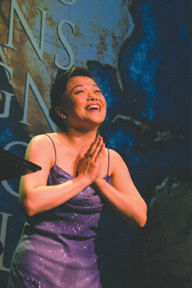 Peabody graduate and rising vocal star Hyunah Yu, soprano, wowed the crowd. "The success of this campaign will literally transform the university and the hospital," said Johns Hopkins President William R. Brody. "It will enable us to move forward with new buildings and campus renovations that will make our facilities the equal of our remarkable faculty and students. And it will provide our teachers and scholars with the resources they need to launch new initiatives and explore new fields of knowledge." "Let your house be open wide." That quote, from the Ethics of Our Ancestors, will greet visitors to the Smokler Center for Jewish Life, Harry and Jeanette Weinberg Building, scheduled to open this spring. The building, which will be dedicated May 2, is designed to help provide a "positive and meaningful Jewish presence on campus" that can be experienced by people of all faiths, says Rabbi Joseph Menashe, director of Hopkins Hillel. "As part of the Hopkins Homewood campus, it's going to help make Jewish life thrive and ensures that Hillel will be part of the rhythm and fabric of student life." In addition to student and staff offices, meeting rooms, and lounges, the building will have kosher kitchens and a Beit Midrash, a traditional library and sanctuary. 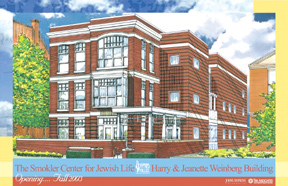 The Smokler Center for Jewish Life, Harry and Jeanette Weinberg Building, scheduled to open this spring, will "help make Jewish life thrive," says Rabbi Joseph Menashe. Initial major funding for the Smokler Center was donated by Irving and Carol Smokler and Family, the Harry and Jeanette Weinberg Foundation, the Joseph Meyerhoff Family Charitable Fund, Terry and Jim Rubenstein, and Norman and Marion Lavy. Members of the Jewish fraternity Phi Sigma Delta also contributed funding toward the Center's social lounge. Four former lacrosse captains, Doug Honig '70, Mark Greenberg '80, Gary Handleman '82, and Doug Fuchs '71, all alumni of the Krieger School of Arts and Sciences, donated two pre-World War II European Torahs for the Beit Midrash. About 12 percent of Hopkins students identify themselves as Jewish. "We're excited that there's a distinctive place for our growing community," says sophomore Elana Snow. "It's a place where all Jewish denominations — Reform, Conservative, or Orthodox — can have their own space." In a grueling test of determination, Devon Struck, SPSBE '03, finished hiking the 2,170-mile Appalachian Trail in October in her quest to raise money for the Brain Injury Association of America. She became aware of the devastating effects of traumatic brain injuries after her bosses' daughter, Stephanie Gianfagna, was left paralyzed and unable to speak following a car accident. Struck, who raised more than $30,000, posted an online account of her six-and-a-half-month journey at www.devonswalk.org. While a Johns Hopkins student, Maria del Pilar Ortega, A&S '02, developed Programa Salud, a program aimed at improving Hispanic cultural competency among healthcare professionals. The program was so successful that it won a Leadership Award from the American Medical Association and is now being implemented at the University of Chicago Pritzker School of Medicine, where del Pilar is a medical student involved in co-curricular cultural competency education. The Johns Hopkins Alumni Council works all year to stimulate alumni interest and promote the welfare of the university around the world, and on October 23, the council's 137 members and guests convened in Baltimore to renew friendships, discuss new initiatives, and celebrate the Alumni Association's numerous accomplishments. For three days, council members met with university officials, participated in workshops, and were reminded of the unique role Johns Hopkins plays in our lives and in the world. 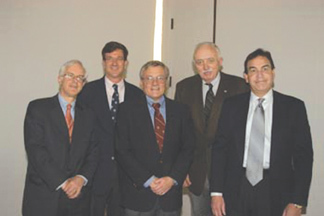 Alumni Council past presidents: left to right, James K. Archibald, A&S '71; Iredell W. Iglehart III, Med '83; Joseph R. Reynolds, Jr., Engr '69 (current); Wendell A. Smith, A&S '54; Douglass A. Fellman, A&S '84. Alumni Council President Joe Reynolds, Engr '69, welcomed members from as far away as London to the 15th annual Leadership Weekend and challenged new members to build upon the impressive legacy that the Alumni Association has created. His predecessors were also in attendance to share in the recognition for all the contributions this organization has made over the years. By funding and organizing chapter events around the globe, providing an online alumni directory and career services, and by keeping 120,000 alumni connected with Hopkins through mailings, newsletters, and Johns Hopkins Magazine, the Alumni Association continues to find new and improved ways to serve the Johns Hopkins alumni community. The council has already answered Reynolds' challenge. On October 24, the Alumni Council and the Sheridan Libraries unveiled plans for Hopkins KnowledgeNET, an alumni virtual library that will provide unrivaled library services and resources to all Johns Hopkins alumni. After its launch this year, alumni will be able to access hundreds of exclusive journals and magazines, such as the British Medical Journal, from anywhere on the globe. All you'll need is a computer and an Internet connection. If you're interested in learning how you can receive KnowledgeNET, visit www.alumni.jhu.edu or call 800-JHU-JHU1. 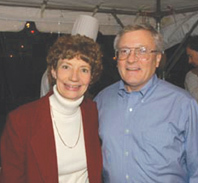 Left, M. Frances Keen, Nur '70; Joseph Reynolds. Not present: Joseph I. Berman, SPH '68; John M. Brickman, A&S '66.